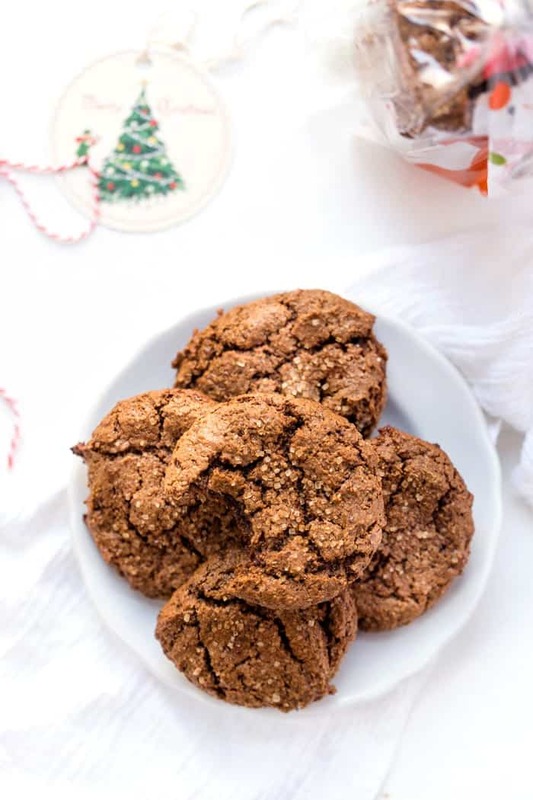 These chewy ginger molasses cookies are a healthy sweet treat and just perfect for the holidays! Gluten-free, grain-free & vegan too! There's nothing that gets me into the holiday season more than baking cookies. I started the day before Thanksgiving and I haven't stopped for the past week. I've made at least 6 dozen cookies and I can officially say… I'm feeling all sorts of holiday-inspired! 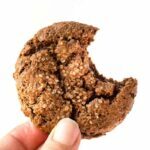 A few of those recipes I've loved (and will be sharing soon), but my favorite by far has been these Chewy Ginger Molasses Cookies! Not only are they healthy, but they're also vegan, gluten-free, grain-free, paleo and use just one bowl. Basically, they're the easiest cookie ever and you're going to love them! I'm bringing you today's recipe in partnership with my friends at Simply Organic. I've talked about them numerous times before, and while I use their spices all year round, it's holiday time that I really rely on them. 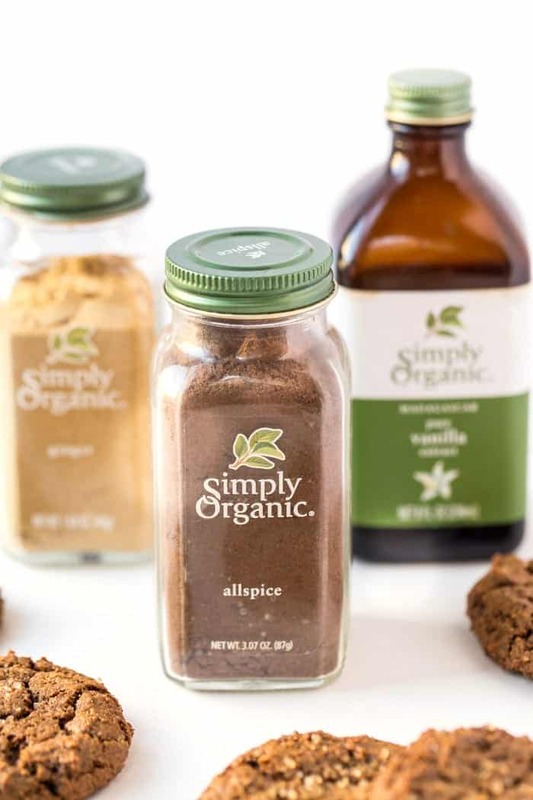 Simply Organic has a spice for all of your baking needs! Everything from the classics like cinnamon, nutmeg and vanilla, to the more obscure ones like five spice or cardamom, there is a spice to bring flavor and excitement to your holidays. 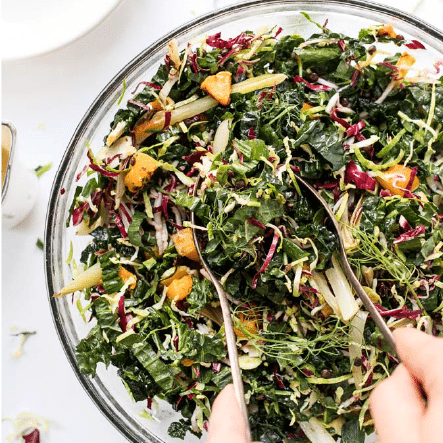 This post is also part of their Cook For A Change campaign which is all about encouraging you to cook from scratch this holiday season and infuse more joy into your life through healthy food shared with your loved ones. And guess what? That's exactly what these cookies will do! There's nothing better than sharing a big plate of healthy cookies with your family and friends and seeing their smiles as they take the first bite! 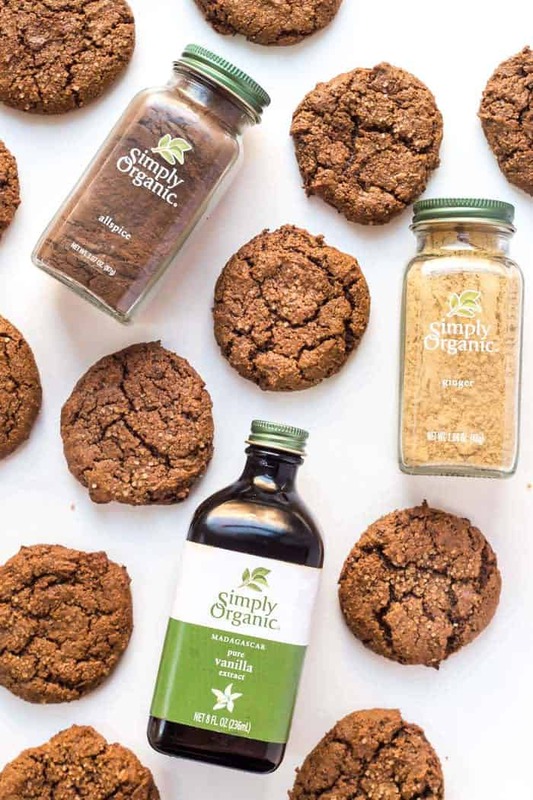 For today's recipe, we're using Simply Organic's classic vanilla extract which adds a really nice pop of flavor to these cookies, as well as their ground ginger and ground allspice. 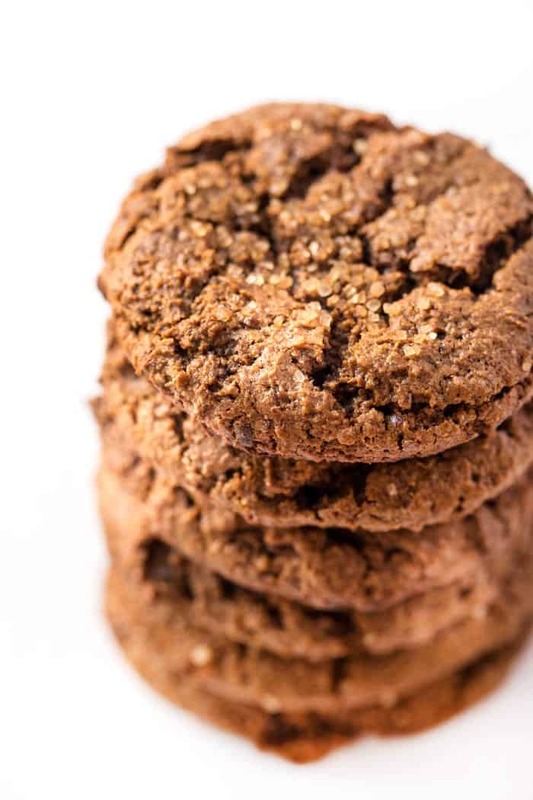 If you love gingersnaps, you're going to adore these cookies. As the name suggests, ginger is the prominent spice used and it's really what gives these cookies their depth of flavor. We're using 1 teaspoon per batch, but if that feels a little too spicy for you, feel free to tone it down to 1/2 teaspoon. Allspice is actually a whole spice that has been ground into a powder. The name was coined hundreds of years ago because it combined the flavors of cinnamon, nutmeg and cloves (<– which I'm sure as you know are very prominent in holiday baking!). 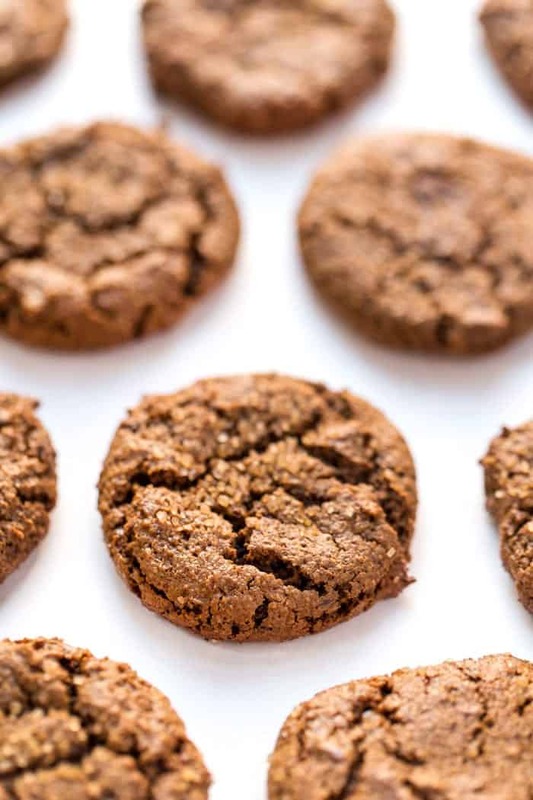 With just the smallest addition of allspice, we really round out the flavor of these chewy ginger molasses cookies! 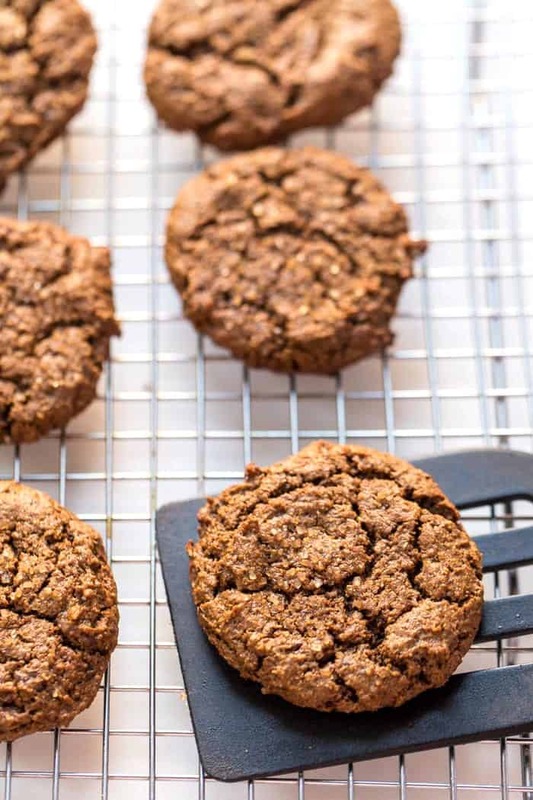 The base of these cookies is almond butter, with a combination of coconut sugar and molasses to give them a touch of sweetness, but also keeping them lower on the glycemic index. We're also adding some coconut flour at the very end, which you can't taste but gives these cookies a really nice, cakey texture. 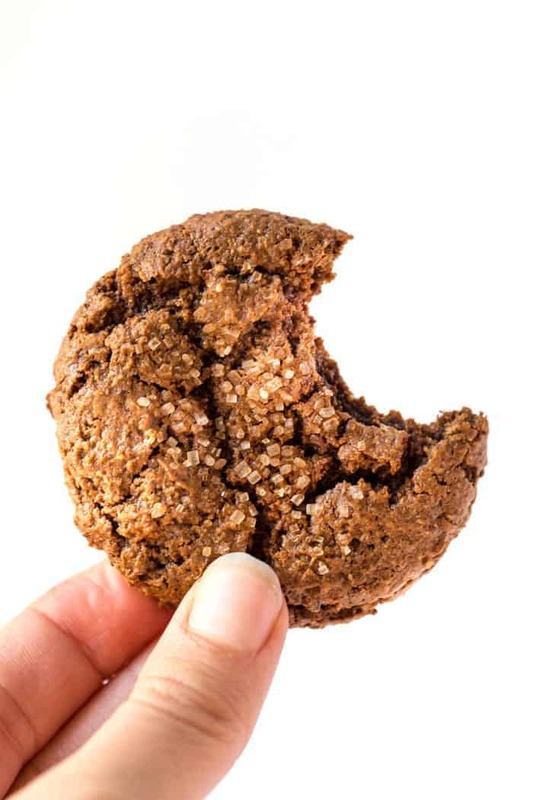 To me, the perfect texture for these chewy ginger molasses cookies is when they have crispy edges and a gooey center. And finally, cool them completely on the rack before diving in! One of my favorite things about holiday cookie baking is that they make amazing edible (and low cost) gifts! But in all seriousness, edible gifts are a really great option if you're on a semi-tight budget or you're shopping for someone who just doesn't need anything (hey, grandma!). Bake them a batch of cookies and I promise they'll love it! There are a few packaging options, but I like to use these cute holiday-inspired cellophane bags with a little tag, but you could also package them up in cookie boxes with a handwritten note. It's thoughtful, creative and something they will so appreciate! Happy holiday baking to you and yours! There will be more healthy holiday cookies coming your way soon, so stay tuned! Preheat the oven to 350ºF. Line a baking sheet with parchment paper and set aside. In a mixing bowl, combine the flax egg, almond butter, coconut sugar, molasses and vanilla. Beat with an electric mixer until smooth. Add the spices, salt, baking soda and coconut flour and beat again until a sticky dough forms. Using a small cookie scoop, drop the dough onto the baking sheet, spacing the cookies at least 2" apart. Repeat until all the dough has been used. Gently flatten the cookies with your hands and sprinkle with sugar. Bake on the center rack for 11 minutes. Remove from the oven and allow the cookies to cool for 10 minutes on the pan before transferring them to a wire rack to finish cooling. Once cool, pack up and/or enjoy! My cookies are in the oven now, but I have one question. 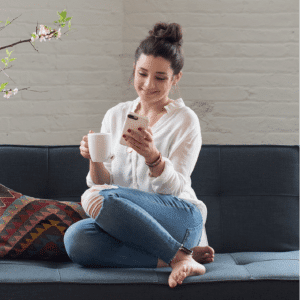 How many cookies per serving size under nutrition facts? One? I didn’t have almond butter, so used peanut. Amazing! Even better left out on the counter for a few days. They get even chewier! Could you use a regular egg instead of a flaxseed egg? Could I sub seed butter for the almond butter? YAY! You’re going to love these cookies! I just love how easy and tasty it seems, definitely makes you want to start learning more recipes!! My favorite holiday tradition is opening pixie/secret santa gifts with my family. Not quite a tradition yet but I’m starting to bake cookies for Christmas. I love Simply Organic spices! Thanks for the chance to win. My favorite holiday tradition is when my family comes together for one day and makes a mass load of vegan kimchi dumplings. These look so yummy Alyssa! Love that they use almond butter in them too! I make chocolate fudge cookies every Christmas. I will have to give your molasses cookies a try. These we’re pretty great only had simply organic ginger to make this recipe but I will make it again in the future! These look so yummy! Will be making them tonight! Thanks for all your wonderful recipes! Can I use almond flour instead of coconut flour? If yes, how much? (I know coconut flour is more absorbent). I love the simplicity of your recipe. I can’t wait to try these delicious looking cookies that I know my family will love. Thanks again for this healthy recipe. Hello. The giveaway sounds neat. Love this recipe! I am excited to try this recipe out!! My baby brother was really big on molasses cookies and so am I!! I’m also a huge fan of Simply Organic vanilla extract. I would LOVE the chance to try out some of their spices!! Thanks so much for sharing this recipe with us!! Favorite holiday tradition is Christmas Pajamas! My favourite holiday tradition is to gather under the Christmas tree on Christmas Eve and listen to the Carols all night with my family 🙂 think I will try these cookies tomorrow! Honestly, mine is waking up together with my family and gathering all together to open up our gifts and see the smiles on eachother’s faces. Ginger cookies are my favorite cookie to make all year long! I have a favorite recipe already, but I am looking forward to trying a healthier version. Thanks! As a holiday tradition, we tend dine out in order to avoid cooking, and then we would follow that up with a family size popcorn feast whilst watching a movie, or tv series. These look delish! And so easy. Can’t wait to make them! They look crazy delicious, I am definitely going to make these! my favorite holiday tradition is baking pies and treats with my mom and then chowing down on them on Christmas day! Am going to make this this weekend for my son who has recently turned to a vegan diet and has been asking me for some vegan “goodie” recipes. This looks like a winner. It started with my mom, and we now also have a holiday tree with all-edible decorations. Decorated cookies wrapped in plastic, popcorn balls, garland of popcorn and cranberries, candy canes, chocolate coins, it is fun to find things. Also, nobody minds taking the tree down, as lots to snack on! My favorite holiday tradition is decorating the Christmas tree with loved ones! I love to bake holiday treats to give to friends and family. These cookies look delicious! I will have to give them a try this season! My favorite holiday tradition is making gingerbread cookies with my family! These sound yummy! I haven’t baked any cookies yet this season, and I can’t wait to start! My favourite holiday tradition is super simple but it’s just having Christmas Eve family dinner with my huge, dysfunctional family! I really enjoy spending time with my family during the holidays. I have a very small family and it’s always good to see my loved ones and have dinner with them. Molasses and Gingersnap are 2 of my favorite cookies! Can’t wait to make these! Love these cookies! I was just searching for cookies to make for my Mom’s Christmas Eve Party, and these popped up! Our favorite holiday tradition is to drive around town to look at the lights after we leave Christmas dinner! Love this recipe, my favorite holiday tradition is getting reunited with my family, share and open our gifts!! Loved your recipe. Will definitely give this one a try. Thanks for the chance for the giveaway. My favorite holiday tradition is baking with my kids. They look so Great! Can’t wait to bake these! My favorite holiday tradition is watching Charlie Brown Christmas and Muppet’s Christmas Carol on Christmas Eve with my family. Yummm! Will definitely try them ! My favorite holiday tradition is my entire family always takes a a pajama picture. We have been doing it for 18 years now! I wonder if there is anything I can substitute for coconut flour. I am allergic to coconut. Hmmm I haven’t tested without the coconut. You could try almond, but the proportions will be very different. I also think oat flour would work, but again, you’ll have to play around with proportions!